Price Tip: If you hate negotiating and still want the best possible deal, always price shop online first. We recommend Car Clearance Deals, MotorTrend, CarsDirect and Edmunds. These free services will offer you the lowest prices on a new Fiat and supply you with multiple competing price quotes. You will know the best price before you visit the dealer. Most people mistakenly believe that the Fiat Invoice Price reflects what the dealer paid for a new vehicle - The true Dealer Cost. It is not! Knowing the dealer cost of a new Fiat gives you needed leverage when it comes time to negotiate a great price. Negotiating from the cost up and not the MSRP down can save you thousands on your next purchase. Getting a good deal on a new car that meets one's needs can be a challenge by itself. Defining what is a good deal requires knowledge of pricing terms. MSRP stands for Manufacturer's Suggested Retail Price. This price is the so-called sticker price. This price is negotiable. The car can be sold for a lot less than that price. Dealer Invoice is the amount the dealership pays to get the car. There are some contractual details that can affect the dealer's invoice. Usually this is the bottom end of the pricing scale for cars. Dealer Holdback is a contractual detail affecting a dealer's invoice. A dealership can have only so many cars on the lot at time. A dealer might order a car but not have the room on the lot for it. The factory agrees to hold on to the car, refunding a bit of the normal invoice price to keep car until there is room on the lot for it. This amount the factory refunds is the holdback. Car manufacturers want their cars to sell. As a result, they are willing to offer rebates and incentives to consumers to purchase their cars off the lot. Destination fees are essentially the flat rate shipping fees for cars. Expect them to factor into the price. In addition to incentives directly to consumers, car manufacturers give incentives to dealers to sell certain cars. These incentives can drop the dealer invoice price. To get people on the lot, the dealership must advertise. The cost of this advertising will be factored into the pricing of the cars. 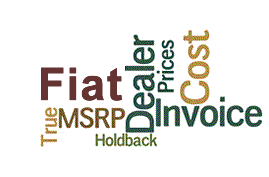 Base FIAT Invoice Price + the dealer Invoice price of Options + Destination - Holdback = Total Dealer Cost.